This group first met at the beginning of August 2011 and rapidly became very successful with a core of enthusiastic members forming a band now meeting for regular practice sessions Tuesday afternoons at the Don Quixote bar near the Paichi Garden Centre. Approximately every alternate month, the group also presents a Music Night to entertain fellow U3A members. 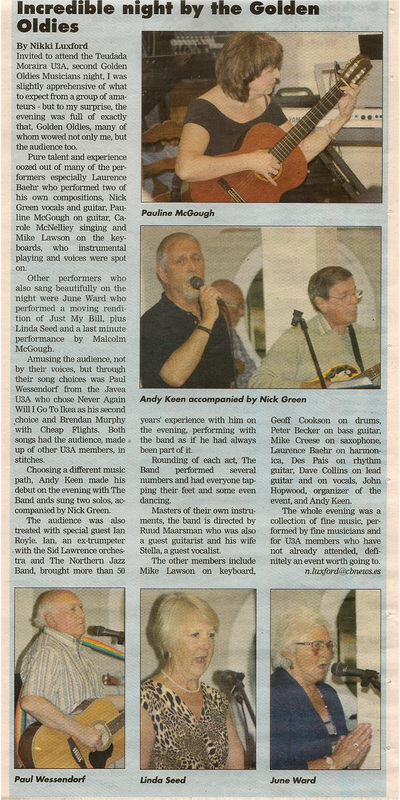 The Golden Oldies Music Group consists of three distinct ‘sub-groups’. The Band, The Solos and The Groupies (the audience). The band now has eleven members, two vocalists, three guitarists, bass player, drummer, keyboard, harmonica and two saxophonists, one of which is also a vocalist. Music played varies from blues to Rock & Roll and some of the great songs from the 40’s through to the latest music. The Solos are members who are mostly wonderful solo singers and guitarists but we also have some great duos. The Music Nights usually consist of music played by the band and some wonderful solo artists – singers and musicians. We also welcome anyone who performs in any way which would entertain an audience of fellow U3A members. It cannot be emphasised too much that the most amateur performers can provide great fun and entertainment when amongst friends – and for those willing to have a go it’s a great way of applying all of those hours you may have spent practicing on your own but never dared to do so in public!! We started our Music Nights at the Ifach Golf Club bar and enjoyed some wonderful evenings there. As we grew we eventually moved to the larger Cafe del Mar and then the Los Limoneros Hotel. Our latest venue is the very popular Les Fouges where we were the first evening event held at this normally lunchtimes only French restaurant. The Music Nights have become very popular and are usually booked up with a reserves list within hours of being announced. Anyone interested in joining us as a performer or to attend a Music Night as a member of the audience please email me (by clicking on my photo at the top of this page).